I’m an old-school interpreter, and Freeman Tilden’s first principle is near and dear to my heart. “Any Interpretation that does not somehow relate what is being displayed or described to something within the personality or experience of the visitor will be sterile.” I work at Frying Pan Farm Park, a 1930’s-era farm that is a time-travelling revelation in one of the most densely populated, diverse counties in the United States. One-point-one million people call 406-square mile Fairfax County home. That’s more people, in one county, than in eight states. More than 180 languages are spoken at home by the county’s elementary school students. Communities vary from Alexandria’s urban, high-rise apartments close to the nation’s capital to Great Falls, where residents fight developmental pressures and try to sustain a semi-rural atmosphere that includes small horse farms. A few decades ago, Tysons was a farm crossroads with only a general store and a gas station. Today, it’s a rapidly developing urban center. Fairfax County is full of dichotomy. It is the second-wealthiest county in the country with a median household income of more than $110,000, yet 28% of the students qualify for free or reduced-cost school lunch programs. New single-family homes can be 4,000 square feet. Some immigrants rent single rooms, or even just a mattress, for their family. This amazing and inspirational diversity of backgrounds, experiences, lifestyles and languages makes relating, interpreting and connecting Fairfax County’s wide-ranging natural and cultural resources to park and museum visitors a bit challenging. Seed-scattered among the concrete weeds are more than 420 parks of the Fairfax County Park Authority that protect nearly 10% of the county’s land. One of those parks is one of the county’s dichotomies — Frying Pan Farm Park in Herndon, Virginia. This 1930s-era working farm preserves a piece of the once-prevalent rural landscape of dairy and mixed-use farms that blanketed Fairfax and neighboring counties for decades. Reaching more than 10,000 school students and a half-million visitors annually, the interpretive team at Frying Pan brings farming, local history and rural life to a broad cross-section of visitors. Sean Redmiles and Claire Thomas, both Certified Interpretive Guides (CIG), are front-line interpreters at Frying Pan who have observed how different visitors from that cross-section react. Students who live close to Frying Pan or in the county’s rural western suburbs can relate to the familiar farm scene. Many have been to the park with their families, or they live on or near a farm. Finding common experiences to build upon with them comes quickly. They are ready to listen, pet a farm animal, and make new connections. Students without those rural experiences begin their journey in another place. It can be a challenge for children to step from book knowledge of a cow, goat or sheep to meeting a 1,200-pound bovine that’s taller than them and moos loud enough to hurt their ears. “There are times where we’ve had kids who have never seen a goat before in their lives, presumably, and when I bring one in they are terrified,” Redmiles explained. “One child started screaming and throwing himself around the room the moment I brought our milking goat in.” It also can be challenging for the youngsters to differentiate between a goat and a sheep. The animals are about the same size and make similar noises. “For people from the suburbs, you have to gently introduce them to the idea that farm animals, even well cared for ones like ours, are not pets. They are potential food sources,” added Thomas. While most farm visitors are omnivores, their only experience with meat is plastic-wrapped cuts at a grocery store or already cooked at a restaurant. Thomas finds a link. Although not ready to see the animals as food, they can relate to how the animals are treated. Youngsters may have pets, so Thomas talks about how farm staff care for farm animals by making sure they have shelter, good food and veterinarian care. When visitors are comfortable and make that connection, they may be ready for the next one — that these animals become food. That takes interpretive sensitivity. The rural atmosphere can be a bridge to connecting with others. This 1930s-era farming is old-fashioned in the U.S.A., but many of those practices remain common in other countries. Visitors from those areas find the familiarity of the farm setting homey and reach out to staff, excited to share experiences from their home country. Thomas recounted one of those moments: “Some visitors from rural El Salvador explained to me, mostly through mime and simple Spanish, that where they were from, they used the gourds we were growing to drink water from and that they were not just decorative as I had supposed. I’ve had a lot of moments on the farm where I’ve been able to connect with people from very different backgrounds than my own. The park has teamed with a nearby elementary school to form a Green Team of students who combine school initiatives with park projects. The Green Team students maintain a vegetable garden on a real working farm. Few of these suburban kids have ever planted a seed or pulled a weed. Starting seeds in their school cafeteria under different kinds of grow lights, with or without heat mats, has become a school-wide science project. As the weather improves in spring, a group of 30 to 40 students come to the park with their parents and teacher twice a month. They transplant the vegetables they started at school and direct-seed more. “The kids love to come and weed for about five minutes and then feed the weeds to the chickens,” said Frying Pan’s Senior Interpreter Patrick McNamara, CIG, who heads the project at Frying Pan. Worms can steal the show because some of the students have never held an earthworm. That’s an interpretive experience they will never forget and one of many “I didn’t know you could” moments they learn first-hand. Others are: I didn’t know potatoes grew like that, tomatoes could get that big, peas climbed a string, vegetables could taste so good. Some of the adults have that same first experience. McNamara said that finding staff to share rural experiences is a challenge. In a generally affluent, well-educated county like Fairfax, understanding and support of environmental issues and protection is common. That’s a boon for recruiting staff at nature centers but not so much for a 20th century farm park. Many successful farm recruits come from visitors who live near the park or who brought their kids to enjoy the animals and are now looking to start a second career. Their passion for the park bridges the knowledge gaps of never having held a chicken, led a goat or learned early 20th century agricultural practices. Staff is hired for their communication skills, and the rest — tractor driving, animal handling and husbandry, crop production, and traditional homemaking — is learned on the job. To “somehow relate what is being displayed or described to something within the personality or experience of the visitor” when those visitors have diverse backgrounds, experiences, lifestyles and languages is an art. Unique visitors are tile chips of different shapes, colors and textures that come together to form a beautiful mosaic. 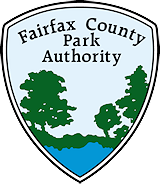 This entry was posted in Uncategorized on April 24, 2019 by Fairfax County Park Authority. Birthing season is a busy time for the farmers at Frying Pan Farm Park. Spring can bring calves, six kids (baby goats), 10 lambs, 20 or more piglets, and chicks and poults (baby turkeys). Here’s some Q-and-A about birthing season from Frying Pan’s park specialist and farmer, Paul Nicholson. When do you know a birth is starting? Staff pay attention to several details to know when to expect a birth. The most helpful is to know when the pregnancy started. We plan most of the breeding at the farm, but there’s still a window of a week or two for some animals. A veterinarian conducts an ultrasound between 30 and 60 days after breeding to confirm a pregnancy, to make sure our males are fertile, and to help adjust the diet of the pregnant animal. Most animals go through physical changes with their udder swelling with new milk and other parts relaxing right before birth. Herd animals usually separate themselves to a quiet maternity corner of the field. Other animals become nervous the day of the big event, scratching at the ground, appearing uncomfortable, and rising and laying down for a few hours before the actual birth takes place. Farm staff and our night maintenance staff check on the expectant mothers a few times each night, as often as every two hours if needed. Livestock are born any hour of the day or night, and farmers have seen many full moons turn into sunrises during deliveries and while waiting for the newborn to nurse. And sometimes you show up in the morning and you find a newborn! How safe is a farm birth? Livestock at the park are used to people, and this helps during the birthing process. We can move the animal to a stall if needed, either to keep out of mud, or to cool or heat the mother, and we have a new shed that has smaller stalls for sows to deliver their piglets. This helps to protect the tiny piglets from being crushed by the larger sow and to protect the farmer, as some sows can become aggressive during the process. What can the baby animal do at birth – and a few hours later? Farm animals are responsive right at birth, with most being able to walk in the first 30 minutes to one hour. The first milk is called colostrum and has important antibodies that the newborn animals need to get started in life. They must drink as soon as they can stand and for the first 12 to 24 hours. After that, they rely on just regular milk from the mother. The farmer working the birth has many jobs. Safety of the mother, newborn, staff and the public are the most important. Location of the birth, field or stall conditions, and temperature are all factors to think about. Depending on the situation, staff will assist with drying the baby and keeping the mother interested in her newborn. If needed, staff will assist with the birth by either repositioning or pulling to get the baby delivered. When there are multiple babies, sometimes a mother forgets to clean the first one and we will help her. Staff watches for signs of distress from the mother or newborn, and staff has access to several veterinarians or other farmers to ask questions. A vet could come to the farm if needed for a problem. And, just like human births, farmers text friends and coworkers to tell them the big news. What do the farmer and the animals do immediately after the birth? After the birth, staff assure mother and baby are bonding and assist with drying off as needed. Observing while interfering the least is the best approach. At the one-hour mark, if the newborn is not standing or trying to nurse, staff can intervene by holding the baby up and holding the mother still to allow the baby to latch on or, if needed, feed the baby by a stomach feeder to make sure it receives the colostrum in a timely manner. What are staff members watching for? We are watching to make sure the birthing process is progressing. Typically, less than one hour after we see feet, the baby should be born in cattle, sheep or goats. The pig farrowing process can take several hours to deliver up to 12 or 14 piglets, but she should deliver a piglet every 30 minutes to one hour. You can look at the feet to determine if the baby is upside down or backwards and take action as needed to correct the problem. Piglets are the exception and can be born backwards or forwards with no issues. Are the animals comfortable with people around? Are the moms protective? Some mothers, after the birth, are not comfortable with us touching their baby. One sheep named Stompy will do just that — stomp her front foot in anger if you get too close during birthing season. I have also seen a cow with a newborn calf charge a fence when a dog walked by. How long before the public can see a newborn? It all depends on when and where the birth takes place. We have had numerous births occur during the day with a large crowd on hand or a few times during evening programs. If the mother and farm staff are comfortable with the process, the visitors can watch the birthing. We try to answer questions and explain what is happening. If we do need to give the mother a quiet space, the public would be invited to see the newborn once everything calms down. A successful birth means family income/table fare. Successful births are important for many reasons. The public side is that everyone is expecting to see a barn full of healthy and happy newborns. The farming side wants to see a full barn of newborns and happy mothers that will raise and wean strong offspring. Some of the babies will remain at the farm and become mothers in the next year or two. The income from new animals was very important, especially during the 1930s, the time frame that Frying Pan re-creates. The farm today sells livestock to 4H clubs in Loudoun, Fauquier and other local counties, and the clubs rely on us for their project animals each year. A farm is a business, and if the farmer lost most of his newborns, the farm would not survive. Frying Pan Farm Park has a birthing announcement web page at https://www.fairfaxcounty.gov/parks/frying-pan-park/arrivals. This entry was posted in Uncategorized on April 8, 2019 by Fairfax County Park Authority.